The quarantine facility removes and isolates suspicious files into a safe location before analyzing them for possible infection. Any files transferred in this fashion are encrypted- meaning they cannot be run or executed. This isolation prevents infected files from affecting the rest of your PC. If a file cannot be disinfected, then it provides a reliable safe-house until the virus database is updated- neutralizing the impact of any new virus. Click 'Quarantined Items' from the main Antivirus Task Manager Screen. 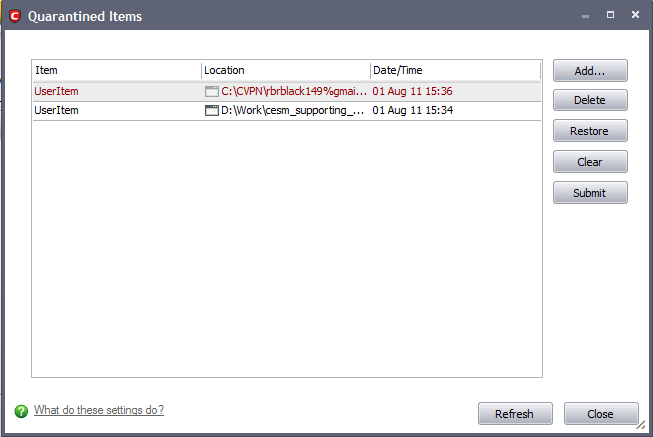 Date/Time - Indicates date and time, when the item is moved to quarantine. If you have a file, folder or drive that you suspect may contain a virus and not been detected by the scanner, then you have the option to isolate that item in quarantine. Click Add and select the file from Open dialog box. Select the item and Click 'Delete'. This deletes the file from the system permanently. Select the item and click 'Restore'. If the restored item does not contain a malware, it operates as usual. But if it contains a malware, it is detected as a threat immediately, if the Real Time Scanning is enabled or during the next scan. This deletes all the quarantined items from the system permanently. Select the item from the list and click 'Submit'. Note: Quarantined files are stored using a special format and do not constitute any danger to your computer.